Restoration. Collision Care. 50s Flair. For over 35 years we’ve specialized in working with our customers budgets and getting them back on the road as soon as possible with top quality parts and precision workmanship. 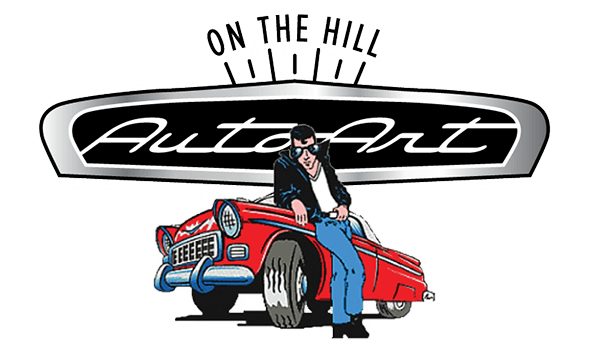 If you’re having car troubles, don’t waste your time searching around for the best auto shops in the area (like I did)- I highly recommend going to Auto Art for any and all car repairs! My repair was finished a day early and less than their estimate! My car looks like new! Everyone there was friendly, knowledgeable, and easy to work with! Based on my experience I’d strongly recommend checking out AutoArt when considering getting body damage repaired. We will definitely be going back to them as my girlfriend needs some body work done on her car. While on a transport to rescue 30 dogs from Arkansas, our van got broken into. Desperate to find someone to help, Bill went above and beyond to take care of us. Not only did he squeeze us in, he personally drove us to a coffee shop while we waited and picked us up. So thankful for Bill getting us back on the road and keeping our puppies warm and safe! Got me a deal to help bring down my deductible! Kept me in with updates and was able to look at my car immediately. They immediately started on it. Privately owned auto shops will always be my preference. I was involved in a hit and run with so much damage to my car but Autoart provided me with the best auto body experince that Ive ever had. Autoart was fast, friendly with top notch quality work. I felt that I barely lifted a finger, amazing experience and will definitely recommend. Outstanding customer service and work. These guys are the real deal and it’s a great feeling to know that I have a new auto shop for my car needs and I’ve seen a lot of them over the years. Their pricing was extremely satisfying and they even drove me back to my apt after I dropped my car off. I would (already have) highly recommend them to anyone. Thanks again!! Great work, incredibly honest (referred me elsewhere for something that would cost less elsewhere), respected my opinion as a female customer, very reasonable.